The Professional Regulation Commission (PRC) and the Board of Radiologic Technology released complete results of July 2014 Radiologic Technologists (Rad Tech) and X-Ray Technologists (X-Ray Tech) licensure exam in 2 working days after the exam. List of passers, top 10 (topnotchers), top performing schools and performance of schools are available on this webpage as officially released online. PRC on Tuesday, July 8, 2014 announced that 1,258 out of 2,150 passed the Radiologic Technologist Licensure Examination and 43 out of 158 passed the X-Ray Technologist Licensure Examination. The Board of Radiologic Technology administered the board examination in the cities of Manila, Davao and Iloilo last July 3 and 4, 2014. The members of the Board of Radiologic Technology are Wilhelmina M. Gana, Chairman; Ms. Cecilia Samaniego-Mananghaya, Dr. Orestes P. Monzon, Mr. Bayani C. San Juan and Mr. Zaldy M. Ambon, Members. Radiologic technology board exams are originally scheduled on June 5-6, 2014 but has been moved to July 2014 to give prospective examinees sufficient time to prepare for the licensure exam. 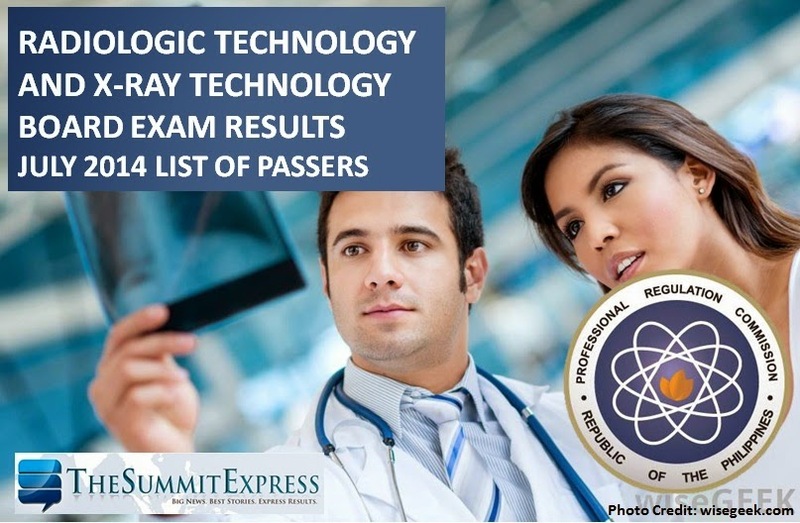 The July 2014 Radiologic Technologists (Rad Tech) board exam covers the following subjects: radiologic physics, equipment and maintenance, radiobiology, radiation protection and quality assurance, image production and evaluation, radiographic procedures and techniques, and patient care, management, ethics and jurisprudence, human anatomy and physiology and medical terminology and radiological sciences. The 2-day X-Ray Tech board exams cover the same subjects above excluding radiological sciences. In November 2013 exam, PRC announced results after 3 working days. A total of 503 out of 1,086 passed the Radiologic Technologist Licensure Examination and 18 out of 89 passed the X-Ray Technologist Licensure Examination. Metro Subic Colleges, Inc. graduate topped the RadTech board with 90.00 percent grade. Registration for the issuance of Professional Identification Card (ID) and Certificate of Registration will be on July 16-18, 2014. Those who will register are required to bring the following: duly accomplished Oath Form or Panunumpa ng Propesyonal, current Community Tax Certificate (cedula), 1 piece passport size picture (colored with white background and complete name tag), 2 sets of metered documentary stamps and 1 short brown envelope with name and profession and to pay the Initial Registration Fee of P600 and Annual Registration Fee of P450 for 2014-2017 for RADIOLOGIC TECHNOLOGIST; Initial Registration Fee of P450 and Annual Registration Fee of P420 for 2014-2017 for X-RAY TECHNOLOGIST. Successful examinees should personally register and sign in the Roster of Registered Professionals. The date and venue for the oathtaking ceremony of the new successful examinees in the said examination WILL BE ANNOUNCED LATER, PRC said. Like Us on Facebook or Follow Us on Twitter to receive updates about Radiologic Technology licensure exam. You may also subscribe to our E-Mail List.